MakeupDownUnder: Clinique Super Rescue Review & Possible Giveaway? Last year, most of my skincare products were from Clinique. But the stand out product for me was the Super Rescue antioxidant night moisturiser. I have normal skin, and decided to get a hydrating moisturiser because it was for night time use and I wanted to make sure my skin would be well hydrated upon waking. Clinique certainly delivered it in this delightfully rich night cream! What it is: This is a moisturiser designed for night time use, to supplement the Clinique 3 Step Skin Care System. It contains antioxidants to fight free radicals that are brought about by stress, sun and pollution in our daily life. It claims to prevent the visible signs of aging as well as keeping your skin strong. 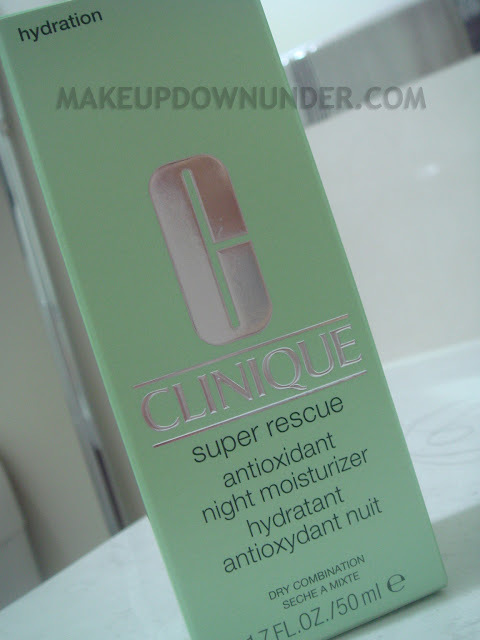 In Australia, the Clinique Super Rescue antioxidant night moisturiser retails for $90 AUD (50ml) and can be found in major department stores, some pharmacies, and can also be ordered online. How I used it: I cleanse my face using the Clinique liquid facial soup (for skin type 2). I skip the toner, as I don't want to use alcohol on my face. I apply one and a half pumps of the Clinique dramatically different moisturising lotion or gel (depending on how my skin was that day. I used the gel more often because I liked the texture better). 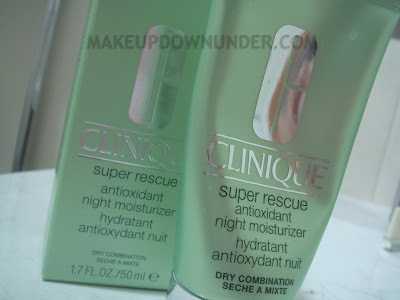 After all that, I would then apply a tiny amount of the Super Rescue night moisturiser (about two thirds the size of a five cent coin) all over my face and neck just before bed. My opinion of the product This night moisturiser is by far one of the best I have tried. I still have a full tube and I intend to go back to it after I have my skin patch test done (to check for allergies). Even though it is far from a natural product, it keeps my skin well hydrated and looking smooth and supple. I like the idea of antioxidants in a facial cream, because it fights the daily bombardment of free radicals I am exposed to in daily life. 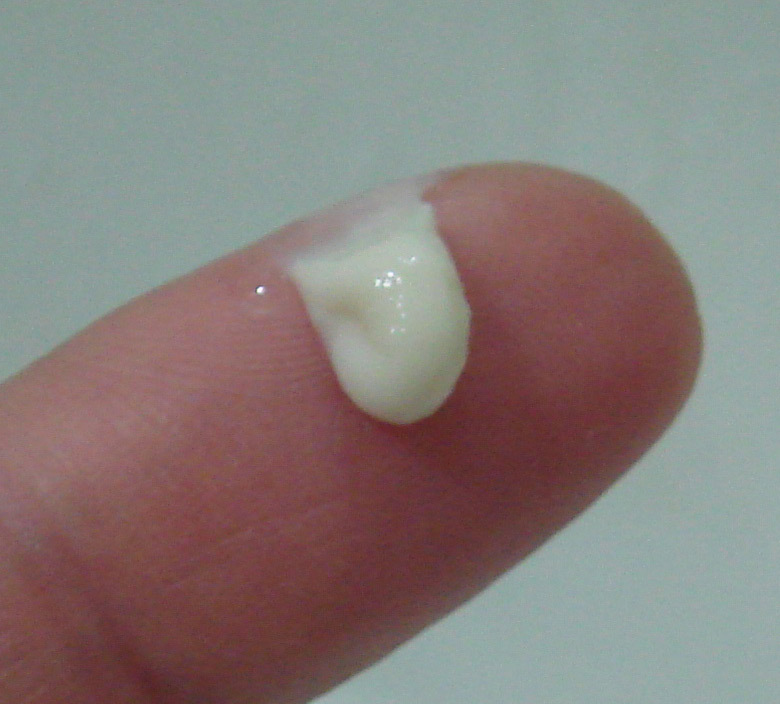 The moisturiser smells pleasant and is very easy to spread on the skin. The only issue with this product is that it leaves my face looking quite shiny, although I don't really mind as nobody sees me when I'm sleeping anyway! The moisturiser is thick and has a yellowish appearance, but is easy to apply and goes on clear. I purchased this product myself from a Clinique counter in Myer last year (have they lowered their prices? I could've sworn it cost me $99!) and have found it to be a wonderfully hydrating night cream that kept my skin looking very supple and fresh. I loved it so much, I received another box as a gift for my birthday in March this year (from family) but have not used it as I started getting into natural products. I don't want this product to go to waste (it will be awhile before I get my patch test done) so I was thinking of having a giveaway. If anyone would be interested in trying out this product, let me know and I will hold a giveaway. If not many people are interested, I might just give it away to someone who really wants to try it (not sure if I can send internationally so it may end up being for only those within Australia). And if nobody is interested, I guess I will just keep this for myself to use sometime next year. So, hands up all those who would like to give this a try! Great review, I'd be interested in trying it. i would love to try it, i am always bombarded with free radicals, and I love clinique products! 1 year extended warranty pertaining to bowling sneakers won't rolex replica as being a good deal in my opinion. Have you considered anyone? My spouse and i thought we would discover only could get additional pertaining to our income along with affirmed I ran across somewhat site that has 12 months involving minimal extended warranty besides Storm’s initial extended warranty. To view the idea by yourself check out LongLiveBowling. com. Certainly not chanel outlet precisely what this means? It implies that will you’ll find no cost transport on the get, so you get 12 months to make the decision regardless of whether you wish to maintain your sneakers. Consequently let’s declare that will for virtually any explanation anyone don’t much like the sneakers you purchased along with need to give back these people. Most you must do can be speak to these people in a calendar year in the invest in along with they’ll happily mail that you a give back brand. Most you must do should be to placed your sneaker field throughout rolex replica article field along with loose time waiting for your current repayment. I’m confident you happen to be sharing with on your own right this moment until this looks way too very good to get genuine, appropriate? I am aware of that will nevertheless My spouse and i in addition need to show you you are drastically wrong in such cases especially along with this is precisely why. While i seen that will pertaining to the 1st time My spouse and i ended up being confident this has been a new fraud. Come on, man the idea seemed too very good to get genuine, appropriate nevertheless My spouse and i ended up being drastically wrong. It can be only LLB’s technique of rolex replica buyers. I do think they’ll have great results along with soon they’ll chanel replica bags additional buyers that they can are able to take care of then when that occurs his or her good terminology are going to be removed forever. I will be significantly enticed from your submit. It is a good and also useful a single. I am going to advise that to be able to my own close friends. Today simply click our own search term Payday Loans Spring-Valley Thank you a whole lot regarding revealing great articles!